Join the Yoga Movement with these new yoga pants from Jockey Scrubs. 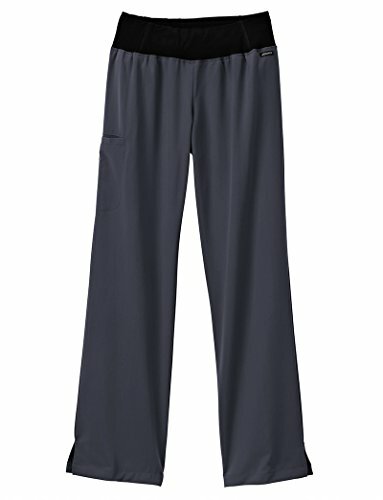 These scrub pants are designed with a contoured yoga waistband that gently hugs the waist and flatters the body. The side panel inserts on the waistband add extra detail and the secure side welt pocket isn't bulky, so it doesn't interfere with the sleek silhouette. 72% Polyester/21% Rayon/7% Spandex. Modern Fit. Regular inseam: 31.5", Petite inseam: 29.5", Tall inseam: 33.5"
Yoga pant featuring a contoured waistband, side panel inserts, and side slits. If you have any questions about this product by Jockey® Scrubs, contact us by completing and submitting the form below. If you are looking for a specif part number, please include it with your message.